Sri Lanka aims to become a connectivity hub in the heart of the Indian Ocean. In other words, the country plans to use its strategic location and leverage on our connectivity to become the Hub of the Indian Ocean. In order to achieve this objective, the required infrastructure should be in place and one of the vital components is the internal connectivity. Restoration of the transport links by rail, road and waterways would involve minimal investments and would result in maximum benefits in the shortest time-frame. Emphasizing this prime need, President Maithripala Sirisena says that our country needs to take many steps in strengthening the road and rail transport services with new technology. Speaking at the ceremony to vest the Kottawa-Makumbura Multi-Modal Transport Hub, constructed according to the international standard, with the public, he said, that for a country vying to attract foreign investments for rapid growth, needs an efficient reliable rail and road connectivity together with other pre-required infrastructure. The Multi-modal Transport Center built under the guidance of Ministry of Megapolis and Western Development will provide the public and the business community an opportunity to avail services of bus, train and taxi at one place for passenger travel and goods freight respectively. Passengers or goods taken by roadways can be interchanged to a railway lines at the centre. 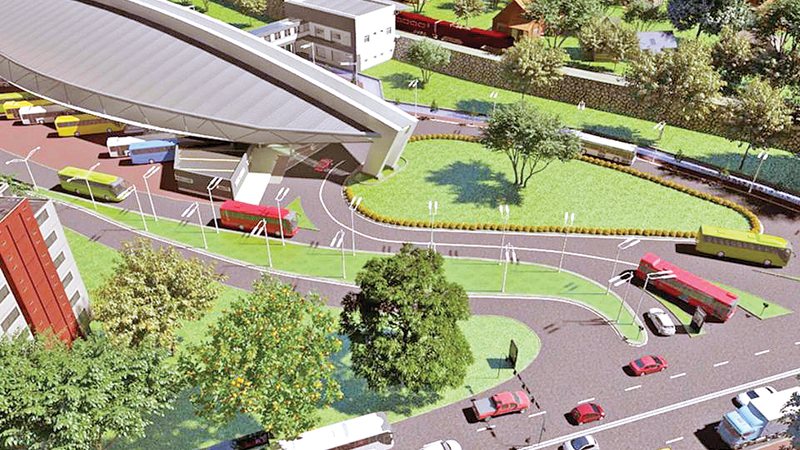 The Multi-modal Transport Center comprised of LED Panels to apprise the public, passengers are informed on the locations of busses and trains at any given time through GPS technology, the online booking of tickets, travel in trains and buses can be made by a single ticket, the availability of self-ticket facilities, restaurants and sanitary facilities, banking facilities, bill payment centres. It is significant that all the energy requirements of the centre are achieved utilizing solar power. This Centre will follow a formal maintenance and management process. Marking another important phase of rail connectivity, the newly constructed Matara - Beliatta railway extension on Southern coastal line was opened last week. The 113-kilometre railway line from Matara to Kataragama is to be completed in three phases and the Matara to Beliatta segment is the first phase of the project. Construction of the Matara to Beliatta section was carried out at a cost of US$ 278 million by a Chinese company with the funding from China Exim Bank. Supervision was done, under the guidance of the Central Engineering Bureau. The second phase of the project is the 48-kilometre segment from Beliatta to Hambantota and in the third phase, the track will be extended to another 39 kilometres covering Hambantota and Kataragama. These internal infrastructure developments are of extreme importance for Sri Lanka to reach a hub position taking advantage of an island-nation geopolitically positioned at an important inter section in the Indian Ocean. The Indian Ocean is being increasingly defined as the ocean of the future. The linkages between the Indian and Pacific oceans are envisaged to create a maritime superhighway that can bring prosperity to all. The Indian Ocean has become another area of global geopolitics. Nevertheless, what others see as competitiveness, the host countries such as Sri Lanka could see as complementary. Several of these advanced infrastructure projects, including the Hambantota Port and the Mattala airport in the South and the Southern expressway have been carried out for this purpose. Furthermore, the development of the three major ports and the two international airports which are all connected by road and rail to the proposed special Economic Zones. Sri Lanka is confident that these initiatives will transform it into a shipping, aviation and a logistics hub. At the same time, Sri Lanka proposes to strengthen financial connectivity by establishing an offshore financial centre in the Colombo Port City, which is a Real Estate Development project commenced under the Belt and Road Initiative of China. 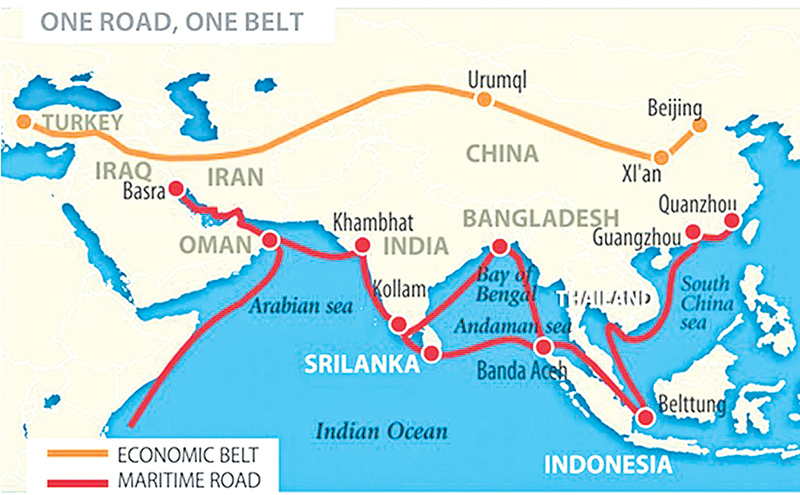 The Belt and Road initiative will provide the much needed connectivity in the Indian Ocean required for rapid economic and social development. One drawback one could see is that India is not very enthusiastic over China’s Belt and Road plans. India also skipped the Belt & Road Forum following sovereignty concerns over the China-Pakistan Economic Corridor. The Belt and Road initiative is the first economic cooperation arrangement connecting the Eurasian continents. Combining the high-income economies with the fast growing economies the initiative will create new opportunities for the growth of global trade. Sri Lanka’s Vision 2025 is founded on a set of core principles including a strategy for national exports, social market economy and a skill pool to match the demands of the job market. Vision 2025 has fixed targets of achieving an annual export income of $ 20 billion, increase Foreign Direct Investment (FDI) up to $ 5 billion and to create employment opportunities for at least a million Sri Lankans by 2025. Today, India’s vision is primarily focused on increasing connectivity within its own borders. When the South Asian Association for Regional Cooperation (SAARC) was set up 34 years ago, the region had high expectations that rivalries such as India and Pakistan would set aside political differences and would strengthen economic, social and cultural and development cooperation in South Asia. However, now we find chances of reviving SAARC is rather dim. Despite that India gave us hopes of close cooperation through two other initiatives – BIMSTEC and IORA. The countries in the region are well aware of the fact the need for peace and stability in the Indian Ocean region. In fact when Indian Defence Secretary Sanjay Mitra called on President Sirisena in Colombo, both emphasized the importance of regional security. This region has enormous economic potential and is the lifeline of global trade. In order to uphold order, a mechanism for cooperation needs to be explored. Sri Lanka strongly believes that there is a need for the Indian Ocean to explore ways to augment cooperation across the maritime domain, such regionalism should strive to create closer linkages between ASEAN, IORA and BIMSTEC. The preference is for a rules-based order in the Indian Ocean that benefits all. Indian Prime Minister Narendra Modi launched his ‘Act East’ policy with the aim to strengthen links between India and member countries of Association of South East Asian Nations, giving India’s landlocked northeast region better access to its southern ports and establishing new land corridors connecting India to Thailand through Mynamar. Connectivity of China with South Asia under the Belt and Road Initiative can only make a better Asia. It is not just about connectivity of roads or seas but connectivity of economies which can improve the lives of people of the whole region of South Asia. Distance does matter, more so in the context of looming depletion of fossil fuels. Rising freight charges will give a fillip to the trend towards making products closer to the market. Regional rather than global production networks are likely to become more important in future. Availability and access to relevant technologies in the neighbouring countries would be cost-effective in the long run and would also bring about harmonization of transport technologies. Restoration of the transport links by rail, road and waterways would involve minimal investments and would result in maximum benefits in the shortest time-frame. With regard to direct connectivity to India, it is necessary to reintroduce the suspended ferry services between Sri Lanka and India. Transport projects are an essential component under various regional groupings (SAARC, BIMSTEC, Mekong-Ganga Cooperation). Need for their integration. Bilateral or sub-regional initiatives would be instrumental in providing the necessary connectivity.